Schizophrenia and Nicotine Dependence: What Psychopharmacological Treatment Options are Available for the Duo Perturbationes? Nicotine dependence has progressively become a foremost community health interest in both the developed and developing nations due to the economic burden and health-related problems. Smoking was significantly higher among patients with schizophrenia in comparison to the general population. Nicotine dependence is not only associated with public stress, but among patients with schizophrenia, smoking brings major challenges to the management. 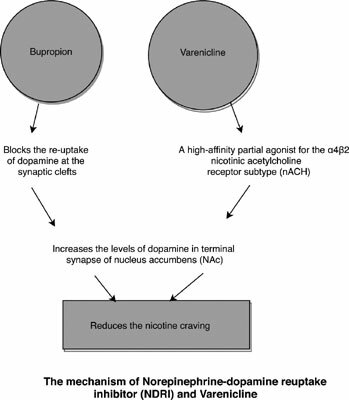 Nicotine may diminish the therapeutic efficacy of the bioavailability of the psychopharmacological agents in-vivo. These duo perturbations, i.e. two clinical conditions co-existed may prevent psychotic symptoms remission among patients suffering from schizophrenia who smoke at the same time. The aim of this review was to highlight the role of pharmacological treatment options and strategies for patients with nicotine dependence in schizophrenia with emphasis on the underlying neurobiological process. The role of nicotine replacement therapy, i.e. norepinephrine-dopamine reuptake inhibition (NDRI) e.g. bupropion and selective partial agonist of α4β2 and full α7-nicotinic acetylcholine receptor e.g. varenicline was deliberated. An ideal choice of drug targets for patients with schizophrenia with nicotine dependence is pivotal to foster a better therapeutic alliance. Nicotine dependence, schizophrenia, treatment options, smoking, psychoactive agents, drug targets.